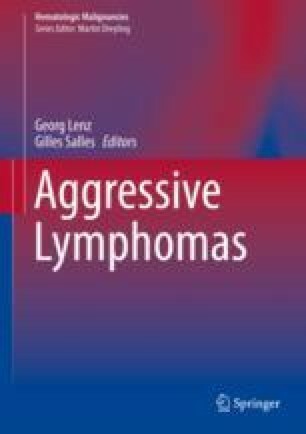 A significant proportion of patients with B- and T-cell aggressive non-Hodgkin lymphomas are not cured by standard of care immunochemotherapy, and recent randomised studies have failed to improve outcomes for patients with the most common type, diffuse large B-cell lymphoma. Advances in molecular biology have confirmed aggressive lymphomas to be molecularly heterogeneous, but at present biological knowledge provides limited guidance for clinical practice. This is likely to change as discovery science and targeted therapies in clinical trials begin to identify subtypes that may respond differentially to specific treatments. This chapter reviews the evidence to date and the prospects for changes to clinical practice in the future. SEER. National Cancer Institute: Surveillance, Epidemiology, and End Results Program. SEER 2017. https://seer.cancer.gov/statfacts/html/nhl.html. Accessed 2 Apr 2017.
https://www.hmrn.org/statistics/incidence. Accessed 25 Jun 2017. ALEX. randomised phase III ALEX. 2017. http://www.roche.com/media/store/releases/med-cor-2017-04-10.htm. ASH Lymphoma Biology Meeting Report. http://www.epizyme.com/wp-content/uploads/2016/06/EPZM-ASH-L-Data-PR-20160619.pdf.